It was ‘party time’ as the ANC factions seemed to take hands. From Nkandla to Bizana – they came from all corners of the country to paint Durban in the black, green and gold colours of the ANC. Dancing to anything from Maskanda to freedom songs, crowds who thronged the Moses Mabhida Stadium, which was filled to the capacity of 85,000, made the atmosphere resemble a politically joyous carnival. 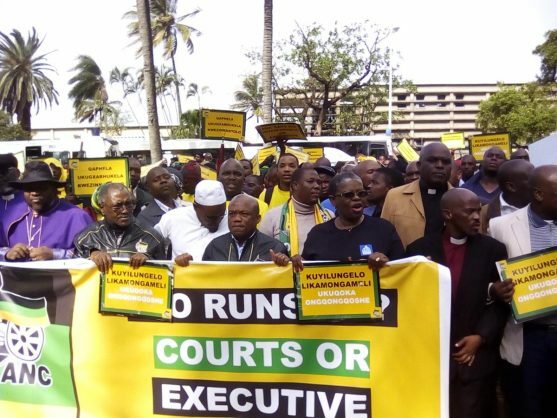 ANC supporters, clad in yellow T-shirts with the face of President Cyril Ramaphosa on the front, marked the effectiveness with which the ruling party campaign has been able to persuade the party rank and file of KwaZulu-Natal about the importance of unity and organisational renewal in the run-up to the 2019 polls. In what was seen as a masterstroke by Ramaphosa, he ensured that his predecessor, Jacob Zuma, was accorded space and recognition wherever he was – cashing in on the former president’s continued popularity in the province. “Zuma! Zuma! Zuma!”, was the reaction from the crowds as Zuma entered the stadium – strong applause compared with the lukewarm reception received by Ramaphosa and the ANC top six. As Mapungubwe Institute for Strategic Reflection research director Susan Booysen put it, accommodating Zuma in the ANC KwaZulu election campaign, was “a strategic move”. So strategic was the move that Zuma’s presence was explained as ensuring that the ANC reclaimed KwaZulu-Natal in the 2019 polls. Strong security presence inside and outside the event precinct saw a massive police deployment. You could not get close to the stage without accreditation. The incident-free event has gone a long way towards reassuring the ANC of its support in a province.